Lowdown: A gang of goodie thieves go on a daring caper from a baddie thief, utilising Minis in the process. I love The Italian Job and it loves me. We've been through a lot together: back in 2003, when this reboot of the 1969 Michael Cane version came out, we watched it at the cinema; later we watched the DVD on a couple of occasions; and moving on with the times, we watched it again via Netflix. We greatly enjoyed this fun movie each and every time. How could we not? Just look at the cast, featuring names like Mark Wahlberg, Charlize Theron, Donald Sutherland, Jason Statham, Seth Green and Edward Norton. Sure, it's a pity there's only one token female character in the entire affair, but this one is all about the action anyway. Do not worry, there's plenty of action, live action of the authentic type; The Italian Job is not just another CGI extravaganza. Living up to its name, the action places Minis in starring roles. So where were we? A group of friendly and cheerful thieves, led by Wahlberg, steals a crate of gold bars through a daring operation at the heart of Venice. Alas, one of the group members (Norton) betrays them, leaves them drowned for dead, and runs off with all the gold. Only that they aren't dead, at least not all of them; they will recruit Theron, and together they will go on an even more daring caper to get what was wrongfully theirs back. 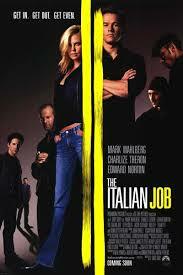 Fun, raw action, good actors doing a good job - that is pretty much all there is to The Italian Job. Granted, by now this movie shows its age here and there. The Minis are not as cool as they used to be when BMW first released their German reboot of the British classic; and the ongoing jokes on Napster's behalf, even featuring cameos by Shawn Fanning, are no longer on the cool side of things (not even when their perpetrator is the voice of Mass Effect's Joker). Yet there is clearly much more on the positive side with this one. Overall: The winning classic action film formula. 4 out of 5 crabs.